We’d love your help. Let us know what’s wrong with this preview of The Sister by Louise Jensen. To ask other readers questions about The Sister, please sign up. I just recently finished this book but I am still a little lost; what was Charlie's secret that she was keeping from Grace? This answer contains spoilers… (view spoiler)[ SPOILERS: The apology was that she was lying to Grace - or at least not disclosing information. Charlie "hated liars", and her mother, Lexi, who was…more SPOILERS: The apology was that she was lying to Grace - or at least not disclosing information. Charlie "hated liars", and her mother, Lexi, who was the one sending the hateful mail to Grace, made Charlie choose between her and Grace. Charlie said she would not tell Grace the truth, but she "had to leave". It was because of Lexi's "letters" that their friend, whose name alludes me, overdosed (she was so lonely because all of her friends hated her and blamed her for the letters to Grace), and Charlie left. Here’s another one of those cases where I was being a good little girl, minding my own business and being all mature; not requesting anything else from NetGalley until my ratio stabilizes (go ahead and laugh). But then all my friends were reading it, and if there’s anything you can count on, its Chelsea not wanting to be left out of the cool reading group. Of course the summary drew me in along with the GORGEOUS cover, so there went my NetGalley sabbatical and all my dignity with it. I’m really Here’s another one of those cases where I was being a good little girl, minding my own business and being all mature; not requesting anything else from NetGalley until my ratio stabilizes (go ahead and laugh). But then all my friends were reading it, and if there’s anything you can count on, its Chelsea not wanting to be left out of the cool reading group. Of course the summary drew me in along with the GORGEOUS cover, so there went my NetGalley sabbatical and all my dignity with it. I’m really glad I let go of my pride and humbly begged for this one, because it was well worth my time. So I started out loving this book!! I wanted to know what was going on! Who did what and why!? Then over half the damn book I wanted to stab everyone in the book!!!! Then toward the end when more revelations came about, I started liking it again. But I'm leaving it at 3 stars for my angst. So there! Mel ❤😡 So I started out loving this book!! I wanted to know what was going on! Who did what and why!? The Sister begins in the present. Twenty-five-year old Grace Matthews is digging up an old time capsule that her and her best friend Charlie buried ten years before. She never thought she'd be alone opening the box that contained all of their hopes and dreams. Things that were important to both of them as well as a bright pink envelope that Charlie slipped in right before they buried it. Grace doesn't know what's in the envelope but hopes if it will give her some answers to all the questions she has. Questions that Charlie can't answer herself since she passed away four months earlier. Charlie's last words go around and around in her head. "I did something terrible, Grace. I hope you can forgive me." When she opens the envelope she realizes just how little she knew about her best friend. Since Charlie's death, Grace has become even more determined to find out what Charlie did that was so terrible. These thoughts occupy so much of Grace's time that she feels she won't be able to move on until she knows everything. It's even affecting her relationship with her boyfriend. When Grace met Charlie in middle school she instantly felt like she could trust her. The book delves into the friendship between her and Charlie as well as their close friends and the drama surrounding them all. There are many references made to Grace's parents and her past. We are aware that something tragic has happened and Grace seems to feel very guilty. She refers to it as the day she's tried to forget. "Am I really to blame? Am I always to blame?" When Grace starts an online search for Charlie's father, someone else from Charlie's past shows up. At first Grace is really happy, but it's not long before strange things start happening. She begins receiving strange phone calls, things start to go missing, and she feels like someone might be following her. She wonders if she's in danger or if she's making a big deal about nothing. When things start to take an even darker turn, Grace doesn't know who to trust. Is this all related to Charlie and the past? Grace feels like someone is playing with her life and she's terrified to find out what they'll do next. I thought "The Sister" was a good psychological thriller. It was easy to follow as it alternated between past and present. The story line and characters were interesting. However, there were a few times that Grace REALLY annoyed me. She would be overly paranoid about some things but didn't seem to notice things that seemed glaringly obvious. A few of the decisions she made really baffled me, but it wasn't enough to dissuade me from continuing on. I did have a few questions but still felt the book ended pretty strong. Although I had to suspend belief occasionally I tried to stop analyzing (so hard for me sometimes) and just enjoy the book. Honestly, all in all it was a pretty good ride. The author did a great job of keeping me in suspense, and there were some good twists that I did not see coming! It was a very hard book to put down. I think this is an very good debut novel and I look forward to more from Louise Jensen. Thank you to NetGalley, the publisher, and Louise Jensen for the opportunity to read this book in exchange for my honest review. Recently, I've been reading a bit more mystery/suspense. 'The Sister' seemed like it would be a great match for me. I love a book that can keep me on the edge of my seat, wondering what is going to happen next and making my heart rate quicken. Grace, the heroine is still reeling from the death of her best friend, Charlie, years later. She never really got over the way that Charlie died unexpectedly. She's left with many unanswered questions, as Charlie died before explaining the cryptic note that Recently, I've been reading a bit more mystery/suspense. 'The Sister' seemed like it would be a great match for me. I love a book that can keep me on the edge of my seat, wondering what is going to happen next and making my heart rate quicken. Grace, the heroine is still reeling from the death of her best friend, Charlie, years later. She never really got over the way that Charlie died unexpectedly. She's left with many unanswered questions, as Charlie died before explaining the cryptic note that she left Grace, apologizing for some unknown wrong. When Grace goes to see Charlie's alcoholic mother, Lexie, she decides to seek out the father that Charlie never met. Enlisting the help of her long-time boyfriend, Dan, Grace begins digging into the past. What they unearth is unexpected. It seems that Charlie had a half-sister that she never knew about, Anna. Before long, Anna has infiltrated Grace's life. The two seem to have far more in common than Charlie. Exactly how much they have in common is something that Grace could not have guessed. The more enmeshed Anna becomes in Grace's life, the more things start to fall apart for Grace. Suspicious things start happening. It seems that somebody is out to destroy Grace. She's being stalked and a string of calamities follow her every move. At more than one point, I questioned Grace's sanity while listening to this audiobook. The story unfolds in pieces, jumping back and forth between the past and present. Piece by piece, the truth comes to light. Sometimes the alternating timeframes don't work so well for me, but I think it helped build the suspense in this story and worked well. That being said, I wasn't as shocked by the "big reveal" as I expected to be. Honestly, it wasn't surprising at all. If anything, the culprit was so obvious that I dismissed it as a possibility. Even though the person harassing Grace was not surprising, the motivations came to light little by little. Although they weren't particularly shocking either, some were a little unexpected. There were a few details that I didn't anticipate. Overall, I give this one 3.5 stars. It was good, but failed to provide the shocking twist that was promised. It held my attention and was entertaining, but didn't make my heart pound or keep me on the edge of my seat. It was good, but I expected more from this one. Though there was something of a slow start, I somehow sensed that this was just an interlude in which to catch my breath before the action really started. Grace, Charlie (Charlotte), and Dan have been friends since primary school. The friendship has endured into adulthood, and while Grace and Dan set up home together, Grace and Charlie still remain inseparable. On Grace's 15th birthday, the girls had buried a memory box, and Charlie put a letter inside and made Grace promise that she won't come back and open the box without Charlie there. Around the time the girls reach 18, Charlie just ups and leaves without saying goodbye, leaving Grace hurt, angry and bewildered. Charlie leaves a message saying she's sorry, and hopes that Grace can forgive her. But forgive her for what? Five years later, Charlie turns up unannounced, but before Grace can ask her what she meant by those words, Charlie collapses and dies. Grace is traumatised, but after some time she decides to find the father that Charlie never knew, thinking it was something that Charlie would have wanted. Dan helps her set up an appeal asking for anyone knowing his whereabouts to come forward. A young woman called Anna comes forward and claims to be his daughter. It's after this that events take a very nasty turn, and that interlude I mentioned at the start was very much appreciated! I received a copy of The Sister by Louise Jensen through NetGalley for an honest review. My thanks to Bookouture and to Louise Jensen for the opportunity. All we needed was the boiled rabbit. Grace Matthews and Charlie Fisher were childhood friends who were as thick as thieves. From the turning of the first few pages, we find out that Charlie has died and Grace is inconsolable. Grace returns to the exact spot where the two had buried a memory box when they were fifteen years old. She digs up the b I received a copy of The Sister by Louise Jensen through NetGalley for an honest review. My thanks to Bookouture and to Louise Jensen for the opportunity. Grace Matthews and Charlie Fisher were childhood friends who were as thick as thieves. From the turning of the first few pages, we find out that Charlie has died and Grace is inconsolable. Grace returns to the exact spot where the two had buried a memory box when they were fifteen years old. She digs up the box refusing to deal with its contents until later. Grace is now twenty-five years old working as a pre-school teacher and living in a quaint cottage with her boyfriend, Dan. Grace has made attempts to check on Lexie, Charlie's wayward mother who battles with vodka bottles on a daily basis. Grace cannot cut the ties that bind. And her tightly wound relationship with the dead Charlie overshadows everything in her life. A letter in that memory box from Charlie insists on finding Charlie's elusive father whom she never met. Grace makes this her zealous quest. The storyline ricochets from "Then" to "Now" which is necessary in order to fill in missing chinks in the armor of this story. While used cleverly by this author, it can be frustrating. Just when you've found a cozy spot on the couch, you're forced to get up and find another. All actions seem to be justified and labeled as such by the author. I did find myself ready to shake Grace out of her naivete state and deflate some of the air out of her head. This one was a little too contrived for my liking. I think the author crammed in too many ideas - multiple deaths, fires, bullying, cheating, stalking and even a psycho for good measure. At some point, it was overkill. Grace has had a hard time coping with the death of her best friend, Charlie. Her marriage is crumbling and she’s racked with guilt. Guilt for things the author only alludes to in the beginning. There is some suspense in trying to decipher what her role has been and a creep factor This one was a little too contrived for my liking. I think the author crammed in too many ideas - multiple deaths, fires, bullying, cheating, stalking and even a psycho for good measure. At some point, it was overkill. Grace has had a hard time coping with the death of her best friend, Charlie. Her marriage is crumbling and she’s racked with guilt. Guilt for things the author only alludes to in the beginning. There is some suspense in trying to decipher what her role has been and a creep factor because someone is constantly lurking in the shadows. Bits and pieces are revealed as the story flips between “then” and “now,” but getting to the truth is painful. A lot of the story felt forced, almost like things were conveniently thrown in just to keep the plot-line going. I don’t know if it’s to alleviate some of her guilt, but Grace decides she’s going to track down Charlie’s father. She ends up meeting Charlie’s half-sister, Anna, instead. Turns out Anna has no family and needs a place to stay. So sure, why not let someone you just met, move in with you and your husband? That sounds normal. There were so many things about this book that didn’t work for me. The biggest being Grace’s naivety. There were times I just wanted to shake her and tell her to wake up! How could she be so blind?! Bad things keep happening to her and she has no clue what’s really going on? I think you would have to be as naive as Grace not to see were this story was headed or who the culprit was. Far-fetched, over-the-top and just too much. I couldn’t wait to get to the last page. Take this review for what it is - my opinion. It could just be a case of me, not you. Especially if you consider, I didn’t share the opinion of many of the other reviews I’ve seen posted. THE SISTER by Louise Jensen is this author’s debut novel, and it is a definite winner…and from my favourite publisher! This is a dark psychological thriller, full of twists and turns and I kept on turning the pages, not willing to miss a thing… wanting to know more. I did not want to do anything else but read this fabulous book. I can’t believe that this is a debut novel! Grace, Charlie and Dan have been friends since public school. Grace and Charlie were best friends…they were inseparable! 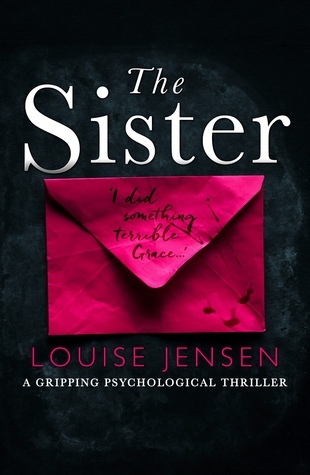 On Gr THE SISTER by Louise Jensen is this author’s debut novel, and it is a definite winner…and from my favourite publisher! This is a dark psychological thriller, full of twists and turns and I kept on turning the pages, not willing to miss a thing… wanting to know more. I did not want to do anything else but read this fabulous book. I can’t believe that this is a debut novel! Grace, Charlie and Dan have been friends since public school. Grace and Charlie were best friends…they were inseparable! On Grace's 15th birthday, Charlie gave Grace “half a gold heart on a chain engraved with BFF”. Charlie had the other half. On this special day, the girls buried a memory box, and Charlie put a letter, a “pink envelope” inside and made Grace promise that she won't come back and open the box without Charlie there. The Sister is written alternately in the current day and the past. The chapters are titled NOW and THEN to differentiate between time frames and this worked well. During this time frame we follow Grace and Charlie as children, teenagers and Grace as an adult. After Charlie’s death, life was a hard struggle for Grace. It affected her relationship with her boyfriend, Dan, and with Charlie's Mum, Lexie. Grace is determined to fulfill Charlie's wish to find the father who abandoned her and to find out what exactly Charlie was referring to when she said she had done something terrible and was sorry. This was a brilliant debut novel. The tension and suspense built up gradually. The story moves along at a balanced pace, with short chapters, as little bits of information are revealed in chapters of 'Then' and 'Now'. The characters in this novel are easy to follow and very engaging, some more than others. The author allows the reader to reflect on their own childhood memories, friendships, things that they shared and other things that they kept hidden. It is also a testament of the strength of character, which allows the traumatised person through acceptance and forgiveness to heal and move on with their life. Many thanks to Louise Jensen, Bookouture and NetGalley for my ARC in exchange for an honest review. I cannot wait for more work from this talented author! Read this book! Grace has a lot of problems. Many months have passed since the death of her best friend, and she still isn’t back to right. She pops pills and guzzles booze to cope. She is shrewish and naggy with her longtime boyfriend. Whiny, brittle, and needy with everyone else. I was somewhat sympathetic in the beginning, but before all was said and done, I just wanted her to stifle herself! It is a matter of supreme indifference to me as to whether I l Copy furnished by Net Galley for the price of a review. Grace has a lot of problems. Many months have passed since the death of her best friend, and she still isn’t back to right. She pops pills and guzzles booze to cope. She is shrewish and naggy with her longtime boyfriend. Whiny, brittle, and needy with everyone else. I was somewhat sympathetic in the beginning, but before all was said and done, I just wanted her to stifle herself! It is a matter of supreme indifference to me as to whether I like the main character of a book or not, but there were so many instances of Grace whimpering, Grace mewling, Grace blaming herself for everything under the sun, that I finally lost patience. Enough is enough, and too much is just foolish. The writing seemed a mite trite and made-to-fit. On the upside, I liked the “Then” and “Now” chapter headings, and the pacing was fine. Also liked the Charlie character, and enjoyed the author’s acknowledgments. Grace and Charlie have been best friends since childhood but when Charlie suddenly dies at 24 yrs old Grace's life becomes upended. She can't eat, she doesn't get out of bed, and her relationship with her long time boyfriend Dan becomes strained to the point that neither seems to want to make an effort anymore. Then Grace's life starts to slowly get back to normal through therapy. She's working again and is trying to maintain her composure. Charlie was raised by a single mom and before she passe Grace and Charlie have been best friends since childhood but when Charlie suddenly dies at 24 yrs old Grace's life becomes upended. She can't eat, she doesn't get out of bed, and her relationship with her long time boyfriend Dan becomes strained to the point that neither seems to want to make an effort anymore. Then Grace's life starts to slowly get back to normal through therapy. She's working again and is trying to maintain her composure. Charlie was raised by a single mom and before she passed away she told Grace how much she wanted to find her father even though her mom won't tell her anything about him. Grace is now on a mission to find him in hopes that it will bring her closure. Who she finds instead is Charlie's long lost sister, Anna, and let's just say this is where things get complicated. Louise Jensen is a wonderful writer and has the incredible ability to lure her readers in. You can't help but to fly through the pages. This was an enjoyable book overall but not the most original nor one I would go around raving about to everyone I know. A quick, easy book to read that would be a great pallet cleanser between heavier, darker reads. That was the best nail-biting page turner I've read in awhile! I could not put this one down. First of all, well done Louise Jensen. Cannot believe this is a debut novel. Really great storytelling and writing. I could not for one second figure out where the plot was going to take me. In my humble opinion, it is the sign of a great thriller writer that the reader is left guessing a different alternative ending from chapter to chapter. She completely had me guessing that one character was the bad g That was the best nail-biting page turner I've read in awhile! I could not put this one down. First of all, well done Louise Jensen. Cannot believe this is a debut novel. Really great storytelling and writing. I could not for one second figure out where the plot was going to take me. In my humble opinion, it is the sign of a great thriller writer that the reader is left guessing a different alternative ending from chapter to chapter. She completely had me guessing that one character was the bad guy... but then - oh wait! - now I think this guy is in on it! I was constantly questioning every character's motives, I trusted no one, and there was a constant sense of doom lingering. My heart was racing the whole read. I also loved all the "British-isms" - the language, the food, the slang - all of it. Thank you Louise Jensen, Bookcouture and Netgalley for a copy of this book in exchange for an honest review. The Sister is another wonderful psychological thriller from Louise Jensen. The Sister was originally published in 2016 and was Ms. Jensen's first thriller but I did not begin reading her work until her next book. So far she has released four thrillers and I'd read three and enjoyed them so when I saw this one was be re-released I knew I had to pick it up and I'm glad I did. The Sister follows twenty five year old Grace who is still mourning the loss of her best friend Charlie. Grace and Charlie h The Sister is another wonderful psychological thriller from Louise Jensen. The Sister was originally published in 2016 and was Ms. Jensen's first thriller but I did not begin reading her work until her next book. So far she has released four thrillers and I'd read three and enjoyed them so when I saw this one was be re-released I knew I had to pick it up and I'm glad I did. The Sister follows twenty five year old Grace who is still mourning the loss of her best friend Charlie. Grace and Charlie had buried some mementos when they were kids and with Charlie gone Grace thinks it's now time to find out what it was that Charlie had put in the box. The Sister thankfully was another that was easy to follow even though it switched between time periods and I never felt lost as it went back and forth the way you may do with some books. With different events going on in both timelines it's almost as if reading two stories but of course everything eventually weaves together wonderfully. Another great read from an author I've come to enjoy. "A psychological thriller with a brilliant twist you won't see coming." That's the promise in the title. My initial reaction was, "I'll be the judge of that." The main character, Grace, was well developed. I could sympathize with her up to a point. At times she seemed too needy, too paranoid, and too willing to jump to conclusions. I liked Charlie more because she was stronger and unafraid of tackling life. I was sorry Charlie just up and left. Anna was everything I expected her to be. Supporting "A psychological thriller with a brilliant twist you won't see coming." That's the promise in the title. My initial reaction was, "I'll be the judge of that." Supporting characters like Dan, Grandma and Grandad and Lexie were important. Grace's mother could have been left out, though, I think. She was so very minor. The switching from Then to Now and back was not a problem for me, but I had to pay close attention to the titles. Many times a Now followed a Now, for instance. If you are a fan of Lifetime movies, you will really enjoy this. I won't bother sharing some of the things that start to If you are a fan of Lifetime movies, you will really enjoy this. I won't bother sharing some of the things that start to go wrong. You've watched these movies, you know what happens. I wish I could say there was something new here, but there just isn't. It's not poorly written, in fact that is what kept it at the 3 star mark. I think the author has a promising future here, she just needs some fresh ideas. Before anyone judges me, I did not know that was the full title of the book I bought because I just went by the Goodreads Paperback Edition. If I had, I would have skipped over this book though the summary did interest me. So here's the main problem. It took way too long for some things to be explained in this book. The sentence structures were choppy as anything and the main character was not that smart. All other characters are not very developed and the twist part of the book I called when I Before anyone judges me, I did not know that was the full title of the book I bought because I just went by the Goodreads Paperback Edition. If I had, I would have skipped over this book though the summary did interest me. So here's the main problem. It took way too long for some things to be explained in this book. The sentence structures were choppy as anything and the main character was not that smart. All other characters are not very developed and the twist part of the book I called when I was around 40 percent. Because everything pointed to this person and you must have never read a book before if you didn't get what was happening. The main character Grace is still reeling from the death of her childhood best friend Charlie. Grace "feels" things a lot so she has taken to drinking and drugging herself because her life has no meaning without Charlie. Though Grace has a great job, a wonderful boyfriend named Dan, and a great relationship with her grandparents, only Charlie is what matters. I really couldn't get a handle on Grace. Certain characters saw her as a strong person and I wasn't seeing it at all. The whole book shows a person who is not handling her grief at all, and was also scared to be abandoned by anyone, and obsessed with her best friend. The secondary characters were so underdeveloped. It took me a really long time to put together the Dan that Grace was in a relationship with, as the Dan she met on her first day of school who was a jerk. And once you figure that out, the book doesn't work when we go back to "Then" chapters that has teenage Grace wanting to be with Dan. You know that she will be with him. The character of Charlie read like a manic pixie girl. I got absolutely no sense of who she was at all in this story besides a character Grace was obsessed with. Other people such as Grace's grandparents, Charlie's mother, etc. were also underdeveloped. People did things that no one else in the world ever would have for no real reason at all except to make sure that this book had a "twist" as far as I can see. The writing was not good. The sentences hung together painfully. "A grey ball of fluff is nestled on the stool of the piano that Dad taught me to play, hoisting me onto the leather stool virtually as soon as I could sit unaided." "Afterwards, we snuggled in the multicolored throws that adorned the back of the sofa, and munched on Hawaiian pizza. I'd told Dan to order a pepperoni--he's never understood fruit on savory food but he knew I loved the sweet and salty combination." "A wave of tiredness washes over me. Alcohol and emotion collaborate, forcing my eyes shut; I rub them, trying to dispel the past." Also the book chapters kept switching between a "Then" and "Now". Frankly it would have made better sense to not do this since it took way too long for certain parts of the story to unfold. I think it may have been around 70 percent before we found out what happened to Grace's father. The flow was terrible from beginning to end. The book jerked to random stops and fits until the end. I know that in life when things go wrong, they tend to multiply and really go wrong. But still I felt that there were just too many things going wrong, too many deaths, too many coincidences and I never really bought into the story. Grace has lost a lot of people - her parents to start with. Then a school friend dies and her best friend, Charlie, takes off on her own without saying goodbye or where she was going. Added to this, Grace has serious trust issues; with her boyfriend, with her friends I know that in life when things go wrong, they tend to multiply and really go wrong. But still I felt that there were just too many things going wrong, too many deaths, too many coincidences and I never really bought into the story. Added to this, Grace has serious trust issues; with her boyfriend, with her friends. So when things go missing, she begins to get phone calls where no one is on the other end, she thinks she's being followed and is receieving threatening notes, she doesn't know who to trust. But her new friend Anna should be fine, right? After all, she wasn't around when all this stuff started. The story is written over two timelines, then and now. Some stories flow seamlessly using this method, mostly this one doesn't. I believe that the story would have had far more impact if it had more time in the 'now' with only occasional forays into 'then' as necessary. It would have ramped up the creepiness factor and perhaps reduced the overload of information which sometimes occurred. This is a new author and all in all I think she has done a good job of her first novel. The only piece of advice I have to offer is don't overcomplicate things - keep it simple. Oh, and avoid things like 'a brilliant twist you won't see coming ' because it diminishes the impact. The book did get my attention from the start, and even though I read it slowly, the story really stayed in my mind, so I never had to go back because I had forgotten parts, which I think is a good sign. The story follows Grace, jumping from past to present, as the plot unfolds. We meet Charlie, her best childhood friend, but right away, it is clear something very wrong happened in the past, and that the effects of that event are seeing into Grace's life in the present. I tend to enjoy these time jump chapters, and Jensen did them well. I don't want to give away too much of the plot, but it unravels quite cleverly, and thought I had certain suspicions from the start, which were essentially confirmed by the end, there were lots of twists and turns I definitely did not expect. I liked Grace, and felt she was well drawn out and real. This book will definitely appeal to fans of psychological thriller and readers who like work by Elizabeth Haynes, Angela Marsons or Claire Seeber. I think this is Jensen's debut, and I really commend her for this strong first work. I really look forward to seeing what she comes up with in the future! I received a free copy of this book from NetGalley and have written what I believe is a fair and fitting review. Thanks! This is an excellent debut novel - a pyschological thriller that builds slowly, gradually filling out the details and adding layers to produce a sizzling finale when it all comes together with some major reveals. Grace had a bad start to her early childhood with her father dying and her mother absconding, leaving Grace to be brought up by her grandparents. She was bullied at school until she met Charlie (Charlotte) who became her champion and best friend. By the time they were 18 they were as clo This is an excellent debut novel - a pyschological thriller that builds slowly, gradually filling out the details and adding layers to produce a sizzling finale when it all comes together with some major reveals. Grace had a bad start to her early childhood with her father dying and her mother absconding, leaving Grace to be brought up by her grandparents. She was bullied at school until she met Charlie (Charlotte) who became her champion and best friend. By the time they were 18 they were as close as sisters but then something happened and Charlie disappeared, leaving Grace bereft. Five years later Charlie returned promising to explain why she left but died suddenly before they got the chance to talk, leaving Grace to grieve again. Living with her boyfriend Dan, Grace is depressed and struggling to cope when she meets Anna, a woman claiming to be Charlie's half sister. They become friendly and Grace even invites Anna to stay with them for a while so she can get to know her better. However, all is not well as strange things are happening to Grace and she is convinced someone is watching her. Grace can't understand why these things happening to her and who could be behind them? The story is told in two threads - NOW and THEN. These weave together well to fill in the gaps and bring us up to the climax of the book where secrets and surprising twists are revealed. Highly recommended to all lovers of psychological thrillers. The Sister by Louise Jensen is a fast paced psychological thriller that is well written & the characters well developed. I really enjoyed this novel & had to review it now. Grace Matthews is heartbroken over the death of her best friend Charlie Fisher Grace returns to the same spot that they buried a memory box 10 years earlier a pink envelope inside she opens it & finds out things about Charlie that she didn't know. Then she comes across a girl claiming to be Charlies sister Anna her The Sister by Louise Jensen is a fast paced psychological thriller that is well written & the characters well developed. I really enjoyed this novel & had to review it now. Then she comes across a girl claiming to be Charlies sister Anna her husband Dan invites her to stay at their home, this is where everything goes out of control terrible things happen to Grace thinks someone in a red car is watching her then her kitten is killed then to top it all off someone tries to kill her. Anna starts getting into Grace's head & sends her to a state of paranoia, Grace hates her & is consumed with rage when Dan admits to having a brief fling with her, this sends Grace over the edge she tells Dan its over. Lexie Charlies Mother is a train wreck waiting to happen the bottle is her best friend I found her to be so fractured & had a lot of torment in her life she was so annoying & weak. I felt at times where Grace's dialogue was written I just wanted to shake her, tell her to move on I found her to be a very weak person in the beginning but by the end she stood up well. BEWARE GRACE ANNA IS WATCHING YOUR EVERY MOVE!!! she was a very nasty piece of work but I actually liked her she had flaws as so many other characters in the book do but I think the author pulled it off with Anna as she had a vulnerable side as well. The Sister is one of those books that, despite being good I also want to slap some sense into some of the characters. Let's start with Grace, she's been in a funk since her best friend Charlie died. And, then she suddenly discovers that Charlie had a sister called Anna. But, at the same time, everything in her life starts to go wrong. It was kind of frustrating to read about how Grace life starts to fall apart and she still doesn't seem to grasp that the person most likely behind it all is livin The Sister is one of those books that, despite being good I also want to slap some sense into some of the characters. Let's start with Grace, she's been in a funk since her best friend Charlie died. And, then she suddenly discovers that Charlie had a sister called Anna. But, at the same time, everything in her life starts to go wrong. It was kind of frustrating to read about how Grace life starts to fall apart and she still doesn't seem to grasp that the person most likely behind it all is living with her and Dan. I mean even Dan doesn't like Anna, actually, he is quite hostile towards her. And, one wonders why Grace boyfriend seems to have a grudge against Anna? There comes a moment when I want to slap Dan to towards the end. Then, we have person number three that I want to slap, Lexie, Charlie's mother. But, despite my hostility towards these three characters is the book very good and thrilling to read. I did suspect the ending, something Charlie said in the beginning of the book, made the little gray cells work harder, so I was not surprised, rather more pleased that my suspicion turned out to be right. I seem to be a bit harsh when it comes to this book. But, I did find it engrossing to read, sure the characters made me wanna scream now and then, but nevertheless, the book was pretty good. There isn't really a-who-is-behind-it-all-kind of a book, more why-is-the-person-doing-this kind of book. The ending was satisfying and I'm looking forward to reading more from Louise Jensen. The Sister is a dark and tense psychological thriller. Initially I was so hung up on the book title, needing to know who the sister was, and how she would be connected to the story. I found myself thinking up all sorts of scenarios. However, one thing I quickly learnt while reading this book, was to expect the unexpected and trust no one! This story has an interesting plot, which despite only having a few main characters, had a lot of layers and depth to it. The characters were well developed. Som The Sister is a dark and tense psychological thriller. This story has an interesting plot, which despite only having a few main characters, had a lot of layers and depth to it. The characters were well developed. Some were less likeable than others. I found myself practically screaming at one character in anger and frustration. I perhaps had some sympathy for them by the end, although not completely, as the book made me feel very nervous and suspicious, so I’m reluctant to fully trust them even now I’ve finished the book. I highly recommend this book to fans of fictional thrillers, psychological thrillers, suspense and mystery. It’s a cracking debut novel by this author. I can’t wait to see what Louise Jensen comes up with next. I will begin by saying this certainly does not read like a debut novel. From page one, it reads as though a seasoned author had put this together. Charlie (Charlotte) and Grace became friends when they met in school. They say that opposites attract, and in this case, it was so true. Charlie was outgoing, friendly, and willing to do almost anything for a bit of fun. Grace is quieter, an introvert, but a willing follower of Charlie. The book takes you back and forth between NOW and THEN, as the girl I will begin by saying this certainly does not read like a debut novel. From page one, it reads as though a seasoned author had put this together. The book takes you back and forth between NOW and THEN, as the girls were growing up. Around their 18th birthdays, Charlie ups and leaves. She says no good-byes other than to tell Grace .. I am so sorry. Please forgive me. But what is she sorry about? And forgive her for what? Five years later Charlie reappears but before they can talk, Charlie falls dead. Grace's dad was killed when Grace was young, her mother abandoned her to her grandparents. The loss of Charlie in her life tears her apart. Anna appears in Grace's life .... she states that Charlie was her half-sister ad Grace gladly welcomes her into their home. And then strange things start happening. Small accidents .. like hazelnut in her coffee when she's very allergic to nuts. Malicious notes left for her. Her car is keyed. Her live-in boyfriend, Dan, has become distant. And Anna moves in. All of a sudden, the friend has become cumbersome. She's always saying things that make Grace feel insecure and she's planting ideas that her boyfriend is cheating. And now her home has been set afire with her in it. Is Anna the culprit? And why would she do these things? Is she even Charlie's sister? When Grace was nine years old she started a new school; in a new town and also living with her grandparents. She had a secret but she kept the sadness hidden – but the teasing and torment of a new student were stopped by Charlie as she stood up for her against the bullies. Grace and Charlie became best friends from that time forward – going through much together but loving each other all the same. But when they were in their early twenties, Charlie died. Grace couldn’t find a way through her grief – it had been four months since Charlie’s death and she had only just gone back to her job at the child care centre. It also felt to Grace that Dan, her boyfriend had drifted from her – he never seemed to be home and often when he was he smelled of alcohol. But when they decided to continue Charlie’s quest to find her father, it brought them closer once again. In the days that followed, Grace was contacted by a young woman who claimed to be Charlie’s sister; the shock was huge. But when Anna moved into their home – “just for a short while” – things began to go very wrong. The obvious dislike of Dan toward Anna surprised Grace – she found herself defending Anna. But Dan’s manner continued to worry Grace; and when strange secrets began to surface plus an image of a shadowy person she kept seeing, Grace knew real fear. What was happening to her? Was she losing her mind? And what did Charlie’s last message to her mean? The Sister by Louise Jensen is this author’s debut novel, and what a cracker it is! A dark psychological thriller, the twists and turns continue in a relentless fashion. I will admit to wanting to smack Grace a couple of times and yell at her because she couldn’t see what I could see! The Sister is written alternately in the current day and the past. The chapters are titled NOW and THEN to differentiate between time frames and it was well done. I had no trouble following Grace and Charlie as youngsters, then teens; or Grace as an adult. A thoroughly enjoyable novel, The Sister is one I recommend highly. Probably more like 3.5 stars. This is the story of Grace, who lives with long-time boyfriend, Dan. As the book begins, Grace is just beginning to get over the sudden death of her best friend, Charlie. Grace decides to try to find Charlie's dad, as her friend had talked about doing that before she died. Then Grace meets Anna, who says she's Charlie's sister. Pretty soon Anna is living with Grace and Dan, and seems to be insinuating herself into every aspect of Grace's life. Meanwhile Grace is starti Probably more like 3.5 stars. Meanwhile Grace is starting to find out more and more about Charlie's life, and realises she didn't know her at all. I did really enjoy this book. I enjoyed the writing style too, it was straightforward and made me want to keep reading. I have to say that I am literally gob smacked that this is the authors debut novel. I mean, to be able to write a story that is woven with so many twists and turns has got to be quite an achievement on it’s own, but to be able to get it spot on in your very first novel? Well that is exactly what Louise Jensen has gone and done. The Sister is literally full of mystery and suspense that constantly has the reader trying to guess in between the lines. Grace and Charlie were the best of friends and liv I have to say that I am literally gob smacked that this is the authors debut novel. I mean, to be able to write a story that is woven with so many twists and turns has got to be quite an achievement on it’s own, but to be able to get it spot on in your very first novel? Well that is exactly what Louise Jensen has gone and done. Grace and Charlie were the best of friends and living out of each others pockets growing up. When Charlie dies, Grace really struggles to carry on with her life as she has so many unanswered questions. The friendship between Grace and Charlie was really great to read, they are very close and through the author I could also very much feel the sense of loss and sadness that surrounds Grace after Charlie’s death. The story flicks between the past and present which really draws the reader into the whole storyline, so much so that I felt so connected with Grace and everything that was going on around her, that I felt like I was going slightly mad with all the horrible things that seemed to keep happening to her. When Anna turns up in Graces life, I was really wary. She just seems to good to be true and around the same time everything in Graces life starts to take a very dark and sinister turn. It’s very obvious that all isn’t as it seems, but boy, when Grace does get to the bottom of everything that is going on, it certainly took me by surprise! The Sister is a wonderfully dark and sinister read that had me hooked from start to finish and I can’t wait to see what else the author has in store for us readers in the future. Think "Single White Female" meets "Fatal Attraction" and you have "The Sister". Although I did enjoy this book, I gave it 3 stars because I felt that there were some plot holes in the story. Also, I felt that the ending was a little rushed or maybe that Jensen was trying to cram too much into too little time left in the book. I'm not really sure. Overall, I think the story works, but there were a bunch of times that I was litera I received this book from NetGalley in exchange for an honest review. Overall, I think the story works, but there were a bunch of times that I was literally rolling my eyes at Grace or I found myself skim reading because I was getting bored with her naivete. And why does every protagonist lately have to be addicted to alcohol, painkillers, sleeping pills, etc...? Maybe I read too many books in the psychological thriller genre, but it seems over the past couple of years, there hasn't been a female lead that isn't induced by some substance. Since Grace's childhood best friend, Charlie, has died, life has been a struggle for Grace. It's been affecting her relationship with her boyfriend, Dan, and with Charlie's Mum, Lexie. Unable to move on, Grace is determined to fulfill Charlie's wish to find the father who abandoned her and to find out what exactly Charlie was referring to when she said she had done something terrible and was sorry. First of all, I was thoroughly impressed by the writing. Absolutely brilliant for a debut novel. I Since Grace's childhood best friend, Charlie, has died, life has been a struggle for Grace. It's been affecting her relationship with her boyfriend, Dan, and with Charlie's Mum, Lexie. Unable to move on, Grace is determined to fulfill Charlie's wish to find the father who abandoned her and to find out what exactly Charlie was referring to when she said she had done something terrible and was sorry. First of all, I was thoroughly impressed by the writing. Absolutely brilliant for a debut novel. It had a great sense of menace that was building up progressively. The story moves along at a steady pace as little bits of information are revealed in chapters of 'Then' and 'Now'. As these tended to end on mini-cliffhangers, I was easily persuaded by the lure of 'just one more'. But it was also slightly frustrating, as I would just get into the flow of what happened 'Then' and - Bam! - I was hurled forward to 'Now' again. Grace managed to redeem herself by the end of the book, but up till then, there were lots of moments where I just wanted to shake her out of her naïveté and tell her to open her eyes and face reality. And who on earth would invite somebody they've only just met to move in? I was pleasantly surprised by some of the revelations as I had been sure I had it all figured out. Definitely a very intriguing story line that was nicely executed. I look forward to reading more by this author. Many thanks to Bookouture for my ARC via NetGalley in exchange for an honest review. I want to thank Chelsea Humphrey for loving this book because it made me want to request it! And I'm so happy that I did:) It's been awhile that I've read a book in one sitting. I decided to begin it late afternoon, thinking I would just read a few chapters before bed. Nope, midnight came along and I was just finishing! So thanks again Chelsea!! The story goes back and forth between Now and Then, which I tend to like stories that do that (if they're done well). It basically focuses on Grace and her life with her best friend Charlie. After Charlie dies (no spoiler--you know that right away), Grace is trying to find her way out of her depression. Then she has a last message from Charlie, something horrible that she had done. So Grace begins to unravel what that might be. Then other things start happening in Grace's life and she wonders if she's starting to lose it. Very creepy and throughout the novel you sense that doom that's awaiting. I very much enjoyed the ride this book gave and would recommend it to anyone that likes a great psychological mystery. A great debut by Louise Jensen! I had high hopes for this book--the premise seemed great and I love a good thriller, but, ultimately, I had trouble even finishing it. The book started off good, told in alternating chapters of Now and Then, from the perspective of Grace--a 25 year old living with her boyfriend, Dan, and still reeling from the recent death of her best childhood girlfriend Charlie. Six years prior to Charlie's death she had left town suddenly, leaving a note for Grace that said "I'm so sorry, Grace. Please forgiv I had high hopes for this book--the premise seemed great and I love a good thriller, but, ultimately, I had trouble even finishing it. The book started off good, told in alternating chapters of Now and Then, from the perspective of Grace--a 25 year old living with her boyfriend, Dan, and still reeling from the recent death of her best childhood girlfriend Charlie. Six years prior to Charlie's death she had left town suddenly, leaving a note for Grace that said "I'm so sorry, Grace. Please forgive me." And that's where the story begins, with Grace trying to recover from her loss and to finally try to find out what Charlie was sorry for. And with the reader wanting to know how exactly Charlie even died (which isn't revealed until very late in the book). It could have been a great story but, for me, way too much of it was simply implausible--over and over again, these things just kept happening that were not realistic and that Grace's character should have been able to see through or figure out. This book had great potential, but tried to do too much, in my opinion--too many implausible twists, turns and wild scenarios made this a 2 star book for me.